View our helpful travel guide for Falmouth. Learn more information about Falmouth. City history, culture, tours and more. See all the tours near the Falmouth area. Falmouth is located on the central North side of the island, approximately 20 miles East of Montego Bay and 60 miles West of Ocho Rios. If you’ve ever ridden on the Main Highway, you’ve probably zipped right by it on your way to Ocho Rios. There is rich history in Falmouth, dating back to the 1800’s when it was the cornerstone of economic boom for this area. As a port city, Falmouth was heavily involved with the sugar and rum trade back in the day. Most items arriving or departing the island left from this historic port. Many structures and well-preserved buildings still exist from that era. Fast forward to today and you see a new cruise ship terminal that put Falmouth back on the map. 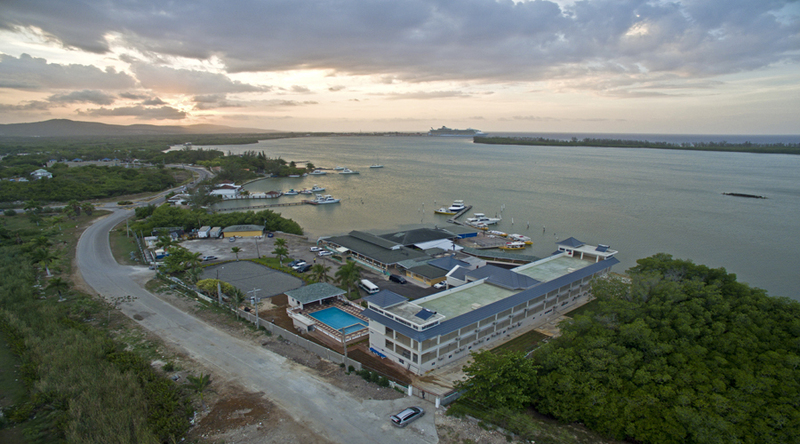 This location gives Jamaica 3 port cities for cruise lines and also brings thousands of tourists to this area on a weekly basis. Seeing how Jamaica is one of the most popular cruise destinations in the Caribbean, this world-class cruise port only helps to ease the crowds on busy cruise ship days to the island. Falmouth is also home to the annual International Marlin Fishing Tournament held every September / October. Anglers from around the world descend upon Jamaica’s North coast for some of the most extreme and rewarding fishing in the Caribbean. Falmouth houses a craft market right in the port area showcasing handcrafted goods and island souvenirs from local artists. Just along the bay lies the famous Glistening Waters Restaurant, Hotel and Marina, a wonderful nighttime tour of the Luminous Lagoon awaits you at this one-of-a-kind attraction. Experience nature and watch the bio-luminescent waters glow and come to life! Truly, an experience not to be missed while in Jamaica. Errol Flynn Tours can accommodate you and your group aboard a luxury 30-passenger, air-conditioned motor coach with reclining seats and head rests. All tours include hotel pick-up and return, city highlights tour, rest stops, entrance fees (EXCEPT Mayfield Falls), Red Stripe beer, Rum Punch, water and soda. Contact us or visit our web site tour links for a full list of the different day tours and excursions we do in the Famouth area. We’ll take you to places and areas so rich and beautiful with spectacular views of the bay and city. Bring your camera because the views around the island are picture perfect!